Somehow I get from quilts to dolls. All my quilting ideas lead me to pop for a bolt of unbleached muslin. Then I get curious about how muslin might be dyed or stamped or painted, which leads me to a book on how easy it is to scribble on white cloth with fat Sharpies, spray the cloth with alcohol and get a wonderful batik-like design. Well, easier said than done. But along the way I see some colorful magical little dolls made with this method. So I give it a try. The alcohol treatment is a mess (as you can see by the experiment on the left below). But the chance to fool around with markers is always fun, so here I am. 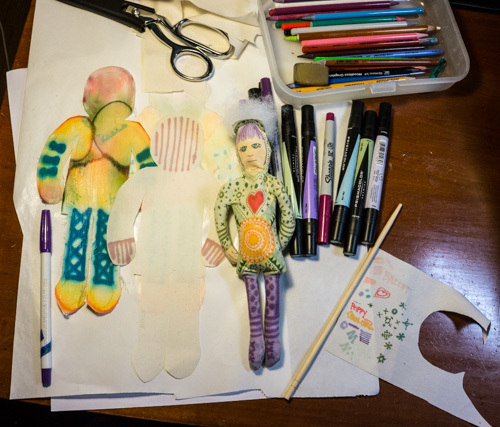 "Basic Doll" is the doll pattern that looks like a paper doll a child would cut on her first foray into the art world, plus an eighth-inch seam allowance. Or a gingerbread man. I draw a Basic Doll shape in pencil on the muslin. I get out my markers, give her a face and begin to dress her. Don't ask me why I give her a hoodie instead of a head of hair; it just happens. Anyway, I doodle on, giving her a heart and an energized belly (where all my good ideas come from). With the doll half drawn, I stare at her and wonder: "What am I doing this for?" She speaks to me (it seems): "To have an adventure." Oh, not to win prizes or to generate gifts, but to have an adventure of the mind as I puzzle through problems and learn new things. Right! By Sunday afternoon I am ready to sew front to back. I decide for this experiment to put a plain piece of scrap cloth on the back (as opposed to designing the back of her jacket and pants). The sewing is easy, except that I make a major error by leaving the opening on the top of her head. The most daunting challenge is turning the doll inside out -- pulling her legs and arms through the hole in her head. Anyone who has done a fair amount of sewing has faced this challenge. There are methods and tools for accomplishing this feat. Still, it is my low point. Why did I make this doll so small, with such skinny legs and arms? Aaarrrgghhh! Why didn't I make the hole on her side? I am sure the stitching will be tugged apart as I wrestle with the task. But within a few minutes it's done. Llike an odd birthing process, it is a thrill to see her little feet and hands emerge through the head hole. When I'm done, she looks like a newborn, all wrinkled and ugly. My baby! After smoothing out her seams, I begin stuffing her with Poly-fil. Oh this is fun! Suddening an appendage is transformed from a limp piece of muslin to a plump little sausage of a doll's leg. It's alive! I'm tempted to stay up till midnight jamming stuffing into my doll, but decide to go to bed and watch a couple YouTube videos on the subject. Tips and tricks are always welcome. On Monday, I finish the stuffing and tackle hand-stitching the closure with my newly learned ladder stitch. Oh, dear. I realize (again) how stupid it was to leave the opening on the curved surface of the head. As a result, the ladder stitch is not as invisible as it is meant to be and her head is lumpy. She also has kind of a crimp in her neck. And her shoulders don't match. And her heart is not aligned with her energy center. I love being adventurous. But not all adventures are welcome. For instance, I don't want any vehicle "adventures" on our upcoming drive to Florida. I prefer self-initiated adventures where I can help it. So I decide to try some folk-art embroidery on the back of Addie, with my favorite advice: "Follow the disturbance." That (i.e. embroidered backstitch) turns out to be harder than I anticipated (like so much). This work has me thinking about the role of dolls in various cultures. 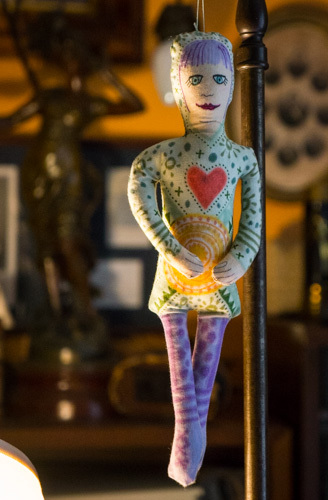 When I ask Jim (the collector of ethnic artifacts worldwide) to define "doll," he first goes with the most pat American perspective: a toy meant to instruct little girls how to be mothers. He's thinking baby dolls. But then there are fashion dolls, often pressed to be role-model dolls (Barbie, American Girl... GI Joe for boys). But what about vodún dolls and ancestor effigies and protective amulet dolls... and puppets... Lots to explore. For me, dolls are portals to the imagination. "Let's pretend." I'm just "following the disturbance" here... we'll see where it goes. Top photo: The finished Doll #1 "Addie"
Photo #2: in process. Two duds to the left. Addie with stuffing coming out of her head. Photo #3: Addie showing that she can carry a note under her arm.